Is the water heater in your San Jose home causing you trouble? Do you need a new one installed or your old one repaired? If you answered “yes” to either of those questions, then it’s time to give the water heater experts at Gladiator Repipe a call! We have years of experience handling all types of water heater troubles, and we always come highly recommended by our many satisfied Bay Area customers. The plumbing and repipe experts at Gladiator Repipe Inc are here to help! Give us a call at (408) 649-7290 to schedule service today! Or, if you’d rather, you can always visit our team of water heater repair and replacement experts at 190 N. Montgomery St, San Jose, CA 95110. If your water heater is showing any of the aforementioned signs, then please don’t hesitate to give us a call. The faster you let us take care of your needs, the less likely any of those problems will get worse and force you into replacing your heater earlier than planned! Save Money With San Jose Water Heater Replacement from Gladiator Repipe! Installing a new water heater in might be necessary for a variety of reasons. Your water heater affects your electric or gas bill, and did you know that 25 percent of each energy dollar is used to heat your water? 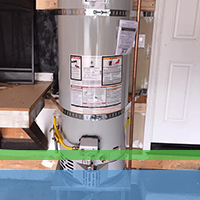 A homeowner can lower their energy bill simply by replacing an old water heater. Most water heaters last 13 years, and if you buy a new home with an older water heater, then be sure to check the age and give our San Jose water heaters experts a call. We service, repair, and install all makes, models and types of water heaters. Call our qualified repair team now at (408) 649-7290! Get a New Water Heater Today! If your water heater is outdated, then you’re probably paying too much for warm showers. You may also be experiencing accumulated mineral deposits that can reduce efficiency, resulting in wasted energy and higher bills. Don’t let an old tank leave you cold. Save money on a new water heater in San Jose whenever you choose the professionals here at Gladiator Repipe!